Editor’s note: For roughly three years, Hyperallergic has been covering the Boycott, Divestment and Sanctions (BDS) movement and how it manifests in the art world, including recently during the 31st São Paulo Biennial. The following report, written by Israeli-Canadian curator Chen Tamir, outlines recent developments in regards to BDS and the positions of various art-related entities. This is the first in a continuing series exploring BDS and its connection to the art world. The following report surveys the pressing topic of the cultural boycott of Israel, focusing specifically on contemporary visual art. Without taking sides, this document synthesizes information on the recent trend to boycott and includes summaries of notable recent incidents around the world of boycotts of contemporary art projects, some boycotting Israel while others calling attention to other causes. This is not a complete survey, but rather focuses on issues of note in an effort to trace the general contours of this growing phenomenon. The cultural boycott is part of a larger call for Boycott, Divestment, and Sanctions (BDS) meant to raise international awareness of the Israeli occupation of Palestine and other human rights violations against Palestinians, and consequently generate pressure on Israel to end them. Within the boycott category are three calls: academic, cultural, and economic (boycotting Israeli products or companies, or those specifically from the Occupied Territories). Divestment, similar to the economic boycott, calls for investors to remove their funds from Israeli investments; and sanctions refer to political and juridical penalties against Israel. This past year, the BDS movement has reached its highest profile yet, with members of the Israeli government now concerned over its impact, especially the economic boycott and divestment and how they may affect the economy. The BDS movement, particularly the boycotts, has gained traction steadily over the past few years, as evidenced by monetary estimates of the cost of the economic boycott. [viii] However, no measurable results to the academic and cultural boycott exist since measuring absence in culture and academia is more challenging; it’s virtually impossible to quantify or even illustrate what is not happening, which artists refuse to work in Israel, or what exhibitions or project could have taken place had the boycott not existed. However, in the field of contemporary art, a few instances in 2013 and 2014 that are examined below are notable examples and can perhaps predict what lies ahead. The most recent noted attempt at a collaborative exhibition with Israeli and Palestinian artists dealing directly with the local situation was to be held at the Mattress Factory in Pittsburgh in May 2014. Titled Sites of Passage: Borders, Walls & Citizenship, the show was part of a series of cultural exchanges between American and foreign artists, and was to involve five Israeli artists and three Palestinian artists. Guest curator Tavia La Follette had traveled to Israel and Palestine for research, but had a hard time finding Palestinians who would participate due to the boycott. The three Palestinian artists who did, as well as the Israelis, agreed to participate in the exhibition with the understanding that it was to directly address human rights violations, but after receiving critical pressure from the Arab world (via Facebook), combined with inflammatory coverage from pro-Israeli media, the Palestinian artists were concerned for their safety, and a potential loss of trust in their community once they returned home. Critics pointed to words such as “dialogue” and “collaboration” that appeared in the official descriptions of the exhibition, claiming they suggest normalization, and while the exhibition received no governmental funding from Israel, these pressures were enough to precipitate the withdraw of the Palestinian artists, and the cancelation of the exhibition. Two articles in the Pittsburgh City Paper reported the story, as did many Jewish newspapers, though it’s hard to assess how much impact it had in the international art community. However, it’s also difficult to imagine any similar serious exhibition featuring Israeli and Palestinian artists taking place today in any well-respected institution. This incident seems to have been the nail in the coffin of joint Israeli-Palestinian exhibitions. Creative Time is a New York based nonprofit that focuses on public and socially-engaged art. For the past several years they have organized an annual conference (“summit”). Just before the 2012 summit, Egyptian media collective Mosireen cancelled their participation in a statement citing Creative Time’s partnership with the Israeli Center for Digital Art (ICDA) on the summit. The ICDA was one of dozens of international bodies that were going to live stream the conference to their local audiences. Normally, the term “partners” refers to institutions that co-produce or fund an event, but Creative Time naively misused this term, making for a possibly ambiguous relationship. The irony lies in the ICDA’s consistently progressive if not radical programming, having mounted many “political” exhibitions and projects (including “Liminal Spaces” mentioned below). Several participants in the summit opened their speeches with a statement supporting the boycott of Israel, or supporting Palestine in general. This generated a somewhat tense environment, suggesting that anyone who spoke against the boycott would be ostracized. However, no steps were taken on the part of Creative Time to address the nature of their partnerships with the organizations live-streaming the summit, nor did they use the opportunity to address the situation as a whole during the summit. Eventually, the ICDA issued a statement, followed much later by a statement by Creative Time, mostly explaining the nature of their partnerships and diplomatically stating support for freedom of speech. Again, notwithstanding the validity of the boycott, it was successful in garnering visibility for the BDS movement and its goals amongst a highly influential and politically engaged group of art world personalities. 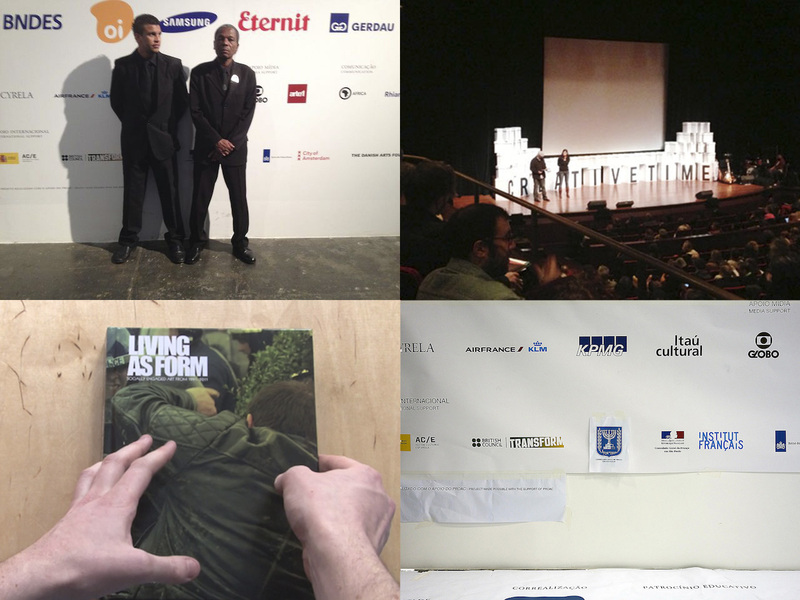 In 2013, despite the turmoil surrounding the previous year’s rendition, Artport, a new, privately-funded residency program in Tel Aviv that focuses on socially-engaged art, live-streamed Creative Time’s 2013 summit, and a few months later mounted Creative Time’s traveling exhibition, “Living As Form.” Circulated by Independent Curators International, the exhibition was first organized in New York in 2011 and surveyed social practice works from around the world. Both the Creative Time summit streaming and later the exhibition of the pared-down traveling version of “Living As Form” took place without incident. However, when a secondary installment of “Living As Form” was mounted a few months later at the Technion in Haifa, as originally planned, several artists withdrew their work and called for the show to be boycotted because the Technion receives state funding (like all Israeli universities, though it is also involved in military arms development). The installment at the Technion, like the one at Artport, was organized by ICI, who manage the traveling show. ICI does not have a policy in place of notifying artists before each rendition of the traveling project. It’s unclear if the artists would have boycotted the Artport installment of “Living As Form” had they known about it. Several statements were issued by parties involved, mostly lamenting internal processes and how they should have notified artists earlier. The story was widely covered by Hyperallergic, with the organizations’ full statement on Art F City, and recapped in an article on Mondoweiss. The most recent large-scale manifestation of the cultural boycott of Israel took place at the São Paulo Biennial in Brazil in September 2014. [ix] The biennial was curated by Charles Esche, Galit Eilat, Nuria Enguita Mayo, Pablo Lafuente, Oren Sagiv and associated advisors Benjamin Seroussi and Luiza Proença. Oren Sagiv and Galit Eilat are both Israeli, the latter being an outspoken supporter of the BDS campaign and a trailblazer within Israel of curating with a politically informed approach. She founded the Israeli Center for Digital Art in 2001, which had carried out projects like Liminal Spaces, an important research platform and exhibition series for Israeli, Palestinian, and international artists that took place from 2004–2006 (more info, including speculations by the organizers on why such a project could not take place today, in my article on the project in The Exhibitionist[x]). It is therefore surprising that the biennial sought and accepted funding from the Israeli consulate, sparking a visible call on behalf of the majority of the participating artists to refuse the funding on BDS grounds. The call was then supported by the curators themselves, who in their statement distanced themselves from the biennial administration that had sought the funding. The situation was resolved in the nick of time by a taped amendment to the sponsorship board that stated that each consulate involved was only supporting artists from their own countries. According to Eilat, she had initially warned the biennial administration staff and board not to approach the Israeli consulate for support, but that board members insisted to follow suit with their general policy of approaching all consulates in Brazil (even those without artists represented in the biennial). According to her, it was unclear until just before the opening whether the consulate would support the biennial. They had not given their answer until 10 days before the opening, probably due to political tensions between Israel and Brazil, who returned their ambassador to express their disapproval of Operation Protective Edge in Gaza. Only after the newly elected President of Israel called to apologize did the consulate award funding to the biennial, which promptly added their logo to all print material and wall credits. Once the funding was revealed, artists called for a boycott and pressured many other participating artists into signing the call, and nightly meetings were held to discuss the issue and possible strategies. The compromise that was ultimately reached of having a statement clarifying that each consulate only funds artists from their own country was a way of keeping the funds from the Israeli consulate without having artists pull out of the exhibition. Interestingly, some artists who might have pulled out as a result of not wanting to indirectly accept Israeli funding cited the dangers they might face in their home countries for ostensibly colluding with the State of Israel. (Funding from the Brazilian government, which has various brutal practices in place, was not put to question.) Regardless of the validity of the boycott or its compromise, a clear victory was won in terms of raising the international visibility of the BDS campaign as one assumes that other international biennials will likely consider this incident when planning their future exhibitions. While the BDS movement is its most widespread and persistent manifestation, the boycott as a tactic to call attention to cultural complicity in systems of power that violate human rights, usually through corporate sponsorship or government funding, has become popular recently at a variety of large-scale contemporary art events around the world — to a point where it might be mistaken as a new form of Institutional Critique. Below is a summary of the major non-Israel boycott events that have shaken the international art world. Abu Dhabi is currently developing Saadiyat Island, a large island off the coast of Abu Dhabi in the United Arab Emirates that is set to become a massive commercial, residential, and leisure center housing the Middle East’s largest cultural hub. Along with other large-scale initiatives, two major museum franchises are being built on the island, one by the Guggenheim Museum and the other by the Louvre. Both museums have faced criticism for “selling out” and arguably compromising their integrity by pursuing for-profit deals, but stronger criticism was lashed at them in 2011 when over 130 artists signed a boycott statement over the exploitation of the construction workers. In the circulated petition, the artists urged a boycott of both the Louvre and Guggenheim museums over concerns regarding the abuse and exploitation of construction workers employed to develop the complex, and said they would refuse to cooperate with the museums until they guarantee the workers fair conditions, including hiring an independent monitor who will publish their findings of the working conditions. The artists formed a group called GulfLabor, which has continued its work since 2011. However, to date, little has changed on the ground, save for the slight improvement of the working conditions of workers building these specific institutions versus the other construction projects on the island. What’s interesting about this boycott is not only its high international profile, but the question of what had made this year’s biennial, after over 40 years of being sponsored by Transfield, the one to be boycotted? Why did this happen now? Australia has a long history of political campaigns by artists, dating back at least to 1973. [xiv] But perhaps it’s other international boycotts occurring over the past two years that also helped galvanize the movement, especially considering the seeds sowed at the previous biennial through some critical artwork addressing the treatment of asylum seekers. While it’s relatively clear how the cultural boycott operates internationally – categorically avoiding anything funded by the Israeli Ministry of Foreign Affairs – the boycott guidelines become murky within Israel since they’re directed at international artists in an attempt at generating international pressure on Israel (rather than by Israelis on their own government; in fact, the BDS movement and the turn to internationals is a direct result of Palestinians’ frustration and critique of Israeli civilian peace initiatives and the need for Israeli approval or cooperation to carry out anti-occupation work). While some people have interpreted the BDS guidelines as categorically avoiding anything Israeli or visiting Israel, the BDS movement does not prohibit visiting Israel, but rather with collaborating with a complicit institution. (They encourage visitors to include elements that educate them about the occupation, such as an Arab-led tour of the occupied territories.) Some have argued that for an artist (or anyone else) to visit Israel or take part in an exhibition at an Israeli institution, she or he would be participating in the Israeli economy as a whole by their presence in Israel, or if the institution itself is funded by state monies, thereby colluding with the state. However, this is not a BDS position, simply a personal preference or possibly a misinterpretation. Many individual artists and curators in Israel have traditionally been at the forefront of social activism and continue to be politically engaged within Israel today, but with limited means. Their most visible contributions seem to be donations to art auctions that benefit various NGOs and activist groups, including a large-scale art sale in September 2014 to raise funds for medical aid in Gaza during Operation Protective Edge that was organized by two Israeli artists based in Berlin. However, little has been happening that deals directly with the boycott. The unfortunate byproducts of a boycott, such as the price individual Israelis pay personally for their national identity, or even the very validity of a boycott, may be secondary to its ability to raise awareness around an issue. More than anything, it is a highly potent PR tool, with the potential to reach far more people than might an exhibition or an artwork. Here lies the second fault line of the boycott: The tension between the content of a work of art and its socio-political and economic context. Many argue that the boycott blocks dialogue specifically where it is needed most; that works of art can reach people who wouldn’t normally be exposed to cultural exchange and goad them to thinking in more complex, open, and holistic ways. In this way, a work of art holds the potential to broaden political awareness and enrich cultural ties. The counter-argument maintains that most artwork is not politically engaged, or not engaged enough, and even if it were, it colludes with the oppressive regime through which it was produced. In other words, political works of art act as a “fig leaf,” justifying a colonialist regime through lending credence to a false democracy; i.e. for every critical documentary film or political work of art the Israeli government can build another settlement on occupied land. Those in favor of a complete cultural boycott will point out a further extended problem with the argument of seeing art as a means of socio-political exchange: Who determines whether a work of art is political enough to be an exception to the boycott? Linear reason will lead to an “art police” or censor tasked with sorting exceptions to a cultural boycott, which is not only ethically problematic, but also highly impractical. One obvious factor in the increase in boycotts internationally is the Internet, which makes communication between and amongst networks of artists and activists more fluid and instantaneous, allowing for the amplification of any given boycott. The abundance of independent news sources and blogs about contemporary art make coverage much more widespread, particularly in the case of boycotts, which are easily put into effect through the simple dissemination of an online statement or petition. Notwithstanding any cynical allusions to “armchair activism” or “clicktivism,” the Internet naturally lends itself to grassroots organization, with a good example being the São Paulo Biennial statements made by the boycotting artists, which are very visible online in contrast to those opposing them. It’s clear that within the international field of contemporary art the trend to boycott is gaining momentum. A recent attempt to counter the boycott was organized by mostly German and Austrian intellectuals and artists, but it’s unclear yet if it will have an effect. (It’s interesting that such a call came from Germany, with its loaded relationship to Israel and its “left” polarized between the camp that supports Israel and the came that supports Palestine.) In any case, after the recent events in São Paulo, biennials around the world will reconsider requesting funding from the Israeli government, and may think twice before inviting Israeli artists, especially ones based in Israel. This grants urgency to the cultural work being done on the ground in Israel, where individuals and institutions may soon find themselves feeling increasingly isolated. ***Special thanks to Galit Eilat, Nir Harel, Ranie Lavie, Romi Mikulinsky, Joseph del Pesco, Michal Sapri, and Kobi Snitz for feedback and to Leah Abir, Hila Cohen-Schneiderman, Omer Krieger, Avi Lubin, and Joshua Simon for feedback and their translation of this report to Hebrew. ii — Boycott calls had appeared as early as the 1980s. A distinction should be made between BDS and other boycotts, especially ones within Israel directed specifically at the Occupied Territories. For example, a group of nearly 60 stage actors, writers, and directors in 2010 released a statement declaring they would not perform in the new theatre in Ariel, a large settlement, or any of the albeit few cultural institutions outside the 1967 border. xix — Richard Stallman, a computer programmer and activist, also spoke at the Arab-Jewish Theatre. In 2006, Roger Waters of Pink Floyd, performed at Neve Shalom, a Jewish-Arab town, though this concert was boycottable because it was organized by Shuki Weiss Productions, a large and “complicit” company that brings many big name musicians to Israel. xxv — This is an important distinction between the BDS boycott, and the boycott of South Africa, which was a categorical boycott.